This is a big mistake that novice investors make. You must know everything there is to know about a company BEFORE you invest money in shares of its stock. You need to know what the company sells, how it earns all of its money, who its customers are, what the company’s competitive advantage is, etc. Is the company growing? Is it adding stores or increasing its revenue through same store sales increases? What are the key metrics that you should be gauging the company on and against its peers? Who is the company’s competition? What makes the competition better or your company better? You must know all of the answers to these questions before you invest one cent of your money in any company’s common stock. You should be able to spout off two or three key points as to why that company’s stock is going to increase in the next six, twelve, or eighteen months. If you do not know these answers, you are doing yourself a disservice. Nothing makes me madder than when people equate investing to gambling. Investing is not gambling, not one bit. Investing is ownership in a company. I buy stock in a company or a mutual fund because I believe in what that company does or sells to us as consumers. If you do not view yourself as an active owner in a company you purchase shares of, you are missing a fundamental piece of investing. Knowing the business, what it does, what it sells, etc. mitigates the chances of you losing your shirt. A share of stock is a piece, albeit a very small piece, of that company, and you should not lose sight of that fact. So, what does that quote mean? You cannot blindly trust the so called experts or the talk show pundits on the television. You must conduct your own research. You must do your own due diligence when looking for stocks and mutual funds to invest in. No one cares more about your financial well being than you do. You owe it to yourself to do your own homework. You do not have to be scared into thinking that you cannot pick your own mutual funds or stock to invest in. Anyone who wants to learn can. That is the beauty of investing and personal finance. Just by reading this blog, you have demonstrated that you want to learn, and you can learn everything and anything you want to about stocks. Do not take anyone’s word for it though. Trust…but verify. You will feel so much better when a financial planner tells you thing if you already know the basics of investing, the stock market, and personal finance concepts. Who Is Peter Lynch? After joining Fidelity, the giant mutual fund and investment firm, in 1966, Peter Lynch rose up the ranks of the company. He eventually became the head of the Magellan Fund which originally had only $18 million in assets. Lynch grew the mutual fund into the largest in the world with more than $14 billion in assets and over 1,000 individual stock positions when he retired as the fund’s manager in 1990. From 1977 until 1990, the Magellan fund averaged a 29.2% return. After retiring, Lynch had secured himself as one of the greatest investors in the world. Lynch’s most famous investment principle was “Invest in what you know”. 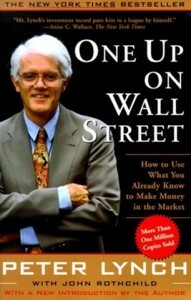 Peter Lynch has written three books on investing that should be on every financial junkie’s bookshelf: “One Up on Wall Street“, “Beating the Street“, and “Learn to Earn“.